Colombian illustrator, Daniel Liev, came all the way to New York this week for the opening night of the Society of Illustrators show. Daniel posing in front of his beautiful book cover, "Antimimesis"
Daniel Liev has been honored by having one of his beautiful illustrations accepted into the Society of Illustrators juried show, in the Book/Editorial category. Ralph Butler's Florida State Quarter Heads to Outer Space! Check out this video interview with illustrator Ralph Butler. He design of the official Florida state quarter was selected to join the New Horizons spacecraft on its voyage to outer space. 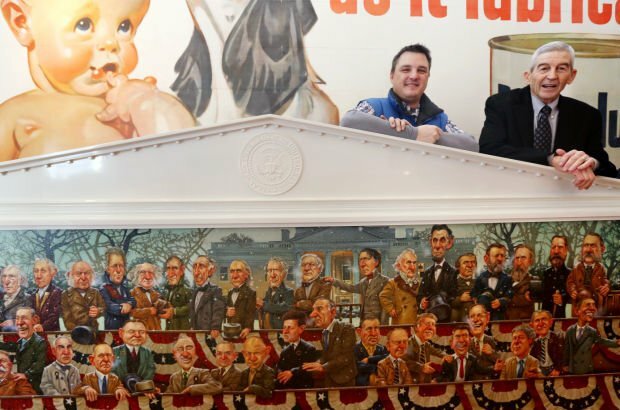 Casper artist Zak Pullen created a 10-foot oil painting featuring all 43 presidents of the United States in his signature caricature style. The piece was purchased by businessman Mick McMurry, right, and will be displayed at the Nicolaysen Art Museum from May 29 through early August. Inside a green house on a suburban street in Casper, artist Zak Pullen worked for a year and a half on a portrait that was the first of its kind. The 10-by-3-foot painting featured 43 men standing on two rows of wooden scaffolding in front of the White House, all with different expressions on their faces, with a varying degree of redness on their noses and cold breath coming from their mouths. Pullen, 39, has been painting professionally for 23 years. He approached McMurry a year and a half ago to see if he would be interested in buying the painting. Pullen had the idea for at least four years, and after receiving the go-ahead from McMurry, he went to work. His preparation included a trip to the National Portrait Gallery in Washington D.C. to study each of his subjects, and contacting someone in the Casper College Theater Department to borrow historical jackets, shirts and ties from certain time periods. The painting is as accurate to each president as can be. Pullen sketched them based on a historical height chart, meaning James Madison (5-foot-4) was the shortest, and Abraham Lincoln and Lyndon B. Johnson were the tallest (6-foot-4). He even built a custom, white base frame, with two large pillars on both sides, shaped to look like the White House. Each portrait is reflective of that president’s personality, and the significance of his time in office. The painting begins with George Washington on the top left row, his right elbow jutting out in a defensive pose. Herbert Hoover is on the bottom row with a forced grin, and to the right of him is Franklin Delano Roosevelt with a huge smile. Harry S. Truman is pictured toward the middle and painted smaller than those surrounding him, as if he was fading into the background. Pullen said the coolest part of the project was learning about the presidents who are not well known. He would wake early, read about a president for an hour, soak up all the information he could, and paint. That was one of the main reasons he decided to paint the presidents in order of their terms. It would be a learning tool for kids, and adults, who only remember the well-known presidents. “We tend to forget about Thomas Jefferson to Lincoln. There’s a blank spot in history, because those are the guys we hear about, it’s Washington, (John) Adams, Jefferson, then all these other people, there’s somebody on a $20 bill that we know about, and then Lincoln and the Civil War,” he said. The painting contains fine details, like a squinting Bill Clinton holding a cigar in his left hand. Other details require a closer eye -- the four presidents wearing black jackets were the ones assassinated in office. Barack Obama, the 44th president but the 43rd man to hold office (Grover Cleveland was counted twice on separate terms), finished off the painting on the far right side, his left arm extended to welcome the unknown. Eric Wimmer, a friend of Pullen’s and the curator at the Nicolaysen Art Museum, had seen the project progress over the year and half. The piece was unveiled to the public at the Governor’s Arts Awards on Feb. 27, where Pullen was one of three recipients. The next public showing will be at the Nic, which will host an exhibit dedicated to Pullen’s body of work from May 29 through the beginning of August. “I don’t know if technically he’s done anything in this (presidential) piece that we haven’t seen in the past, but it’s the concept behind it and the boldness of it that we’ve not seen before,” Wimmer said. As for what’s next, Pullen hopes that multiple character portraits will be his future. He’s already in the early stages of sketching the winners of the British Open, as well as a first ladies painting. And the ideas keep coming. Heat recently collaborated with California wine company "Les Grands Vins de Colette" to create a passionate brand story for the company's first offering. San Francisco based creative agency entered into an enthusiastic, yet strategic, partnership with the winemaker to conceive and deliver a strong, resonant, and complete brand experience. "We did this project for trade, which I think says volumes," commented John Elder, President of Heat. "While we are used to working on higher-profile projects for much bigger companies, we are very passionate about wine and opportunities where we are liberated creatively. We jumped at the chance to develop a brand like this one from the ground up. It was an unique collaboration to uncover stories about Claire-Marie's amazing grandmother and then translate those stories into a brand that was true to the winemakers and the wine." Among many other things, that process of collaboration and discovery revealed that Claire-Marie's Vietnamese grandmother actually adopted the name Colette out of reverence for the French writer. The name of both the company and the wine is thus an homage to the grandmother. Evocatively diverse elements of Colette and the Laidley's lives are reflected in the intricate design of the Chardonnay's bottle and label. Through an intricate illustration by artist Dennis Auth, the label of the new Chardonnay employs an ornate bramble of grape bunches, vines, and leaves to frame and highlight a variety of evocative icons, each corresponding to a significant element in the lives of Colette and the Laidleys. An old-style book, pen and inkwell, for example, refer to the admired writer and her influence on the grandmother. An elegant pocketwatch reveals the time to be 9:12, representing the Laidley's wedding anniversary of September 12. Mahjong tiles, a cycle rickshaw, and lotus flowers reflect elements of Colette's life in Vietnam, while a Labrador dog, lavender flowers, and olives reveal elements of the Laidley's life in California. "At the same time that they are discovering the taste of this brand new wine, we wanted people to discover something of the story behind the wine," said Nicole Berger, Art Director at Heat and on the Colette project. "There is a limited amount of space on the label to convey such a rich history in words, so we employed iconic images from that history to intrigue wine drinkers into a deeper experiential connection with this new vintage."